While New Orleans may boast that it is the "birthplace of jazz," New York City's borough of Queens has its own proud claim: it has been the "home of jazz," the residence of choice for hundreds of the music's leading players. 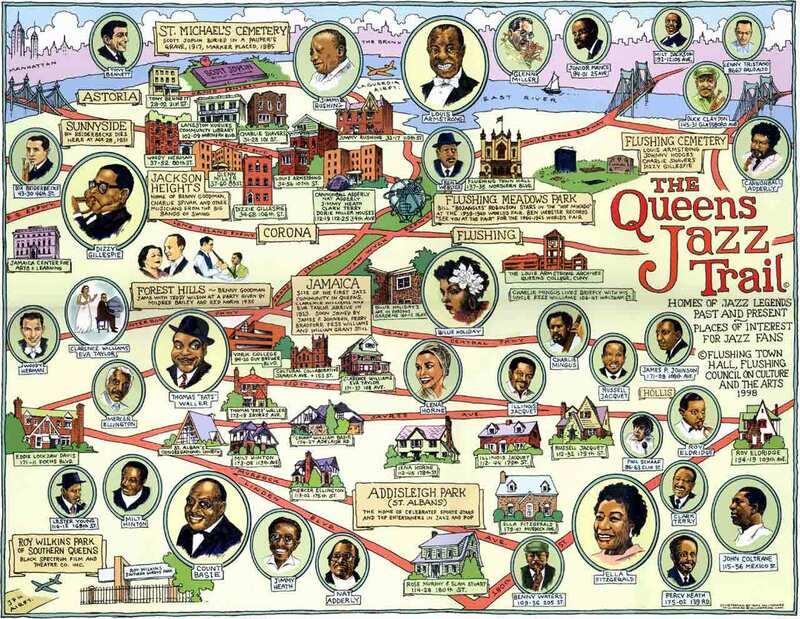 The award-winning Queens Jazz Trail map (originally commissioned by Flushing Town Hall) shows the different neighborhoods and sites that are part of this hidden jazz history. 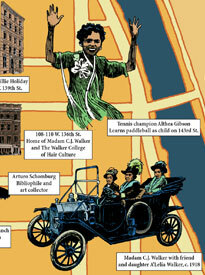 Featuring portraits of jazz greats and drawings of their houses, this pictorial map makes a beautiful poster. The back of the map contains a short history of jazz in Queens; the addresses of homes once occupied by jazz musicians; and sites of current interest to jazz fans. 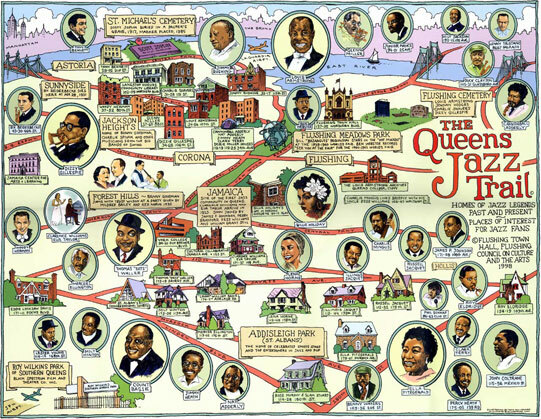 The Queens Jazz Trail Map is much more than an attractive wall poster. 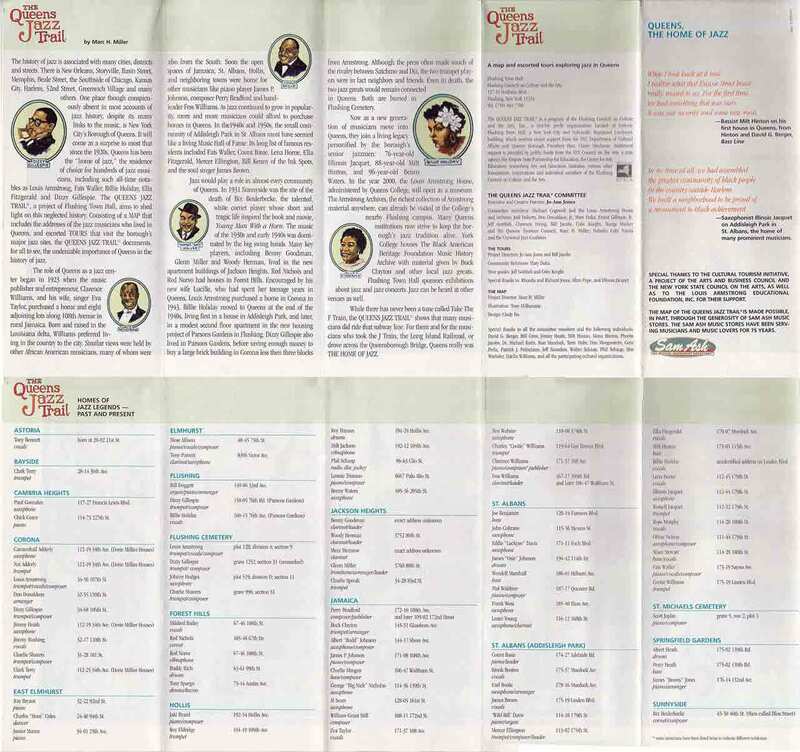 It also contains a short history of jazz in the borough of Queens and an address directory that locates the homes of famous jazz musicians and other sites of interest to jazz fans. 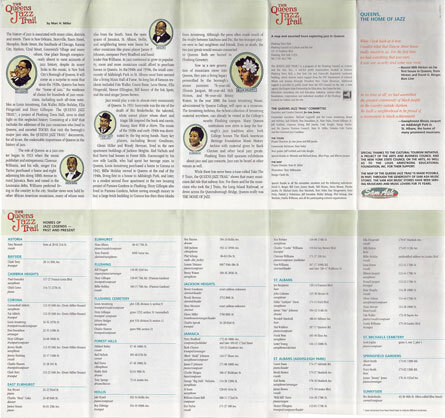 The address directory is printed on the back of folded Queens Jazz Trail maps. Unfolded posters and framed maps come with a separate four-page booklet containing the directory information. Many famous jazz musicians and sports stars owned homes in Addisleigh Park. The neighborhood was recently made into a historic district. Everything you need to know about Louis Armstrong, his Corona Queens house (now a museum), and the extensive Armstrong Archives now at Queens College. 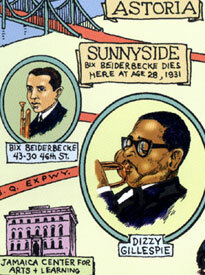 An account about the placement of a commemorative plaque outside the Sunnyside Queens apartment building where jazz legend Bix Beiderbecke died at age twenty-eight. Singer Tony Bennett is an accomplished painter and a native of Astoria, Queens. The premier venue for music in Queens with great jazz programming. Until his death in 2000 Hinton was the heart of the Queens Jazz Community. This rich website commemorates his achievements as a bass player and as a prolific photographer. An article by the great jazz historian Nat Hentoff. 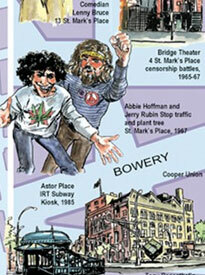 This Associated Press article describes a Queens Jazz Trail tour organized by Flushing Town Hall. An informed account of the famous jazz musicians who lived in Addisleigh Park with photographs of many of their homes. 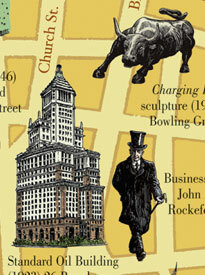 This web page is part of Forgotten NY, a great online resource for obscure information about the city. Founded by Jimmy Heath, the Queens Jazz Orchestra is dedicated to preserving the heritage of jazz in Queens.